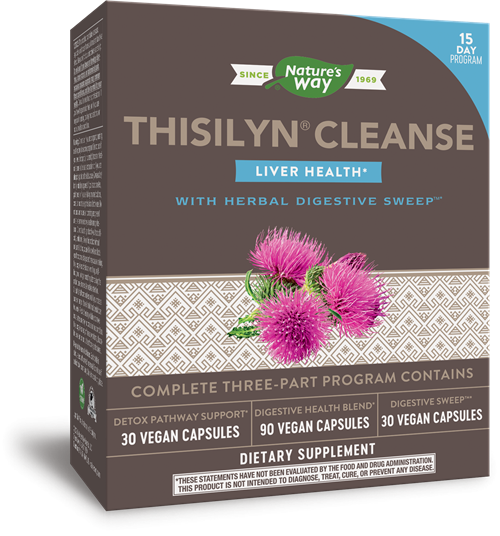 Thisilyn Herbal Cleansing Kit / 1 kit - Nature's Way®. Alternative. If you’d prefer a formula that doesn’t contain Cascara Sagrada, try Thisilyn® Cleanse with Mineral Digestive Sweep™. PHASE III: Herbal Digestive Sweep™: Adults and children age 12 years and over: Take 3 capsules at bedtime with a full glass (8 oz.) of liquid. Take fewer capsules, if desired, but do not take more than 3 capsules in a 24-hour period. Not recommended for children under 12 years of age. Do not take for more than 10 days as frequent or prolonged use may result in dependence. Do not exceed recommended dosage. Not for long term use. Using Thisilyn® Cleanse: For best results, begin taking all three formulas the same day. Drink plenty of water during the entire program. Thisilyn Cleanse takes just 15 days to complete. NOTICE: This product contains Cascara Sagrada which can have a stimulant laxative effect. Read and follow directions carefully. Do not use if you have or develop diarrhea, loose stools, or abdominal pain, because Cascara Sagrada may worsen these conditions, and be harmful to your health. Consult your physician if you have frequent diarrhea, or if you are pregnant, nursing, taking medications, or have a medical condition. Do not use if you are pregnant, nursing, or attempting to become pregnant. Do not use if you are allergic to plants of the Asteraceae (Compositae) family, including ragweed, have a bile duct obstruction, or gallstones. Do not use when nausea or vomiting are present, unless recommended by a healthcare professional. Do not take this product if you have difficulty swallowing. Take this product with at least a full glass of liquid. Taking without adequate liquid may cause choking. If you experience chest pain, vomiting, or difficulty swallowing or breathing after taking this product, seek immediate medical attention. Consult a healthcare professional if you notice a sudden change in bowel habits that persists over two weeks. Rectal bleeding or failure to move bowels after use may indicate a serious condition, discontinue use and consult a healthcare professional. If you have diabetes, or are taking any medications, consult a healthcare professional before use. This product is not intended for children.